John R. Westerberg, third-generation owner of Nelson Westerberg, Inc., is recognized for industry service since 1962 and as a member of the Atlas Van Lines network. 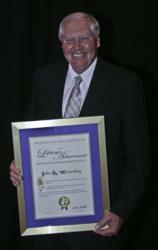 Westerberg received his accolade from the American Moving & Storage Association. Nelson Westerberg, Inc., a global provider of moving and storage services to corporations, families, government and the military, today announced its CEO John R. Westerberg has received The Lifetime Achievement Award for Distinguished Service by the American Moving and Storage Association’s philanthropic arm, The Moving and Storage Institute. In business since 1904, Nelson Westerberg annually manages more than 15,000 moves. Under John Westerberg’s leadership, the company transformed from a small coal and ice moving business into an $80 million annual revenue corporation – serving consumers, corporations, government and the military. He also initiated a program for equipment upgrades within Nelson Westerberg, made multiple changes in the relocation business model and led the industry in the introduction of a new method for auto relocation. An integral part of Atlas Van Lines’ success and growth, Westerberg assisted Atlas Van Lines in expanding operations into all 50 states, initiating the annual Forum on Moving, established a Consumer Advisory Council, expanded World Headquarters and furthered quality and accountability standards throughout the company. The Moving and Storage Institute was founded to foster educational opportunities in the moving and storage industry, facilitate development of industry education and certification programs, and to cultivate a broader understanding and appreciation of household goods transportation and warehousing. To receive the prestigious Lifetime Achievement Award for Distinguished Service, nominees must be active (minimum 20 years of service) in the moving and storage industry. Judging criteria include advanced industry operations via technological development, sales innovations, new moving techniques or service organizations while enhancing the industry’s public image with leadership and integrity. With International headquarters located in Chicago since 1904, Nelson Westerberg is a global provider of moving and storage services to corporations, families, government and the military. Annual revenues for Nelson Westerberg exceed $80 million dollars, and it manages over 15,000 moves annually with coast-to-coast offices in Chicago, New York, Atlanta, Dallas and Los Angeles. Nelson Westerberg, through its affiliation with Atlas Van Lines, has storage warehouses throughout the United States and Canada. In addition, its international division is a member of FIDI/FAIM that provides a network of over 500 agents throughout the free world. Nelson Westerberg employees number in excess of 250 in addition to its approximately 125 owner-operators in its domestic operations. Follow Nelson Westerberg on LinkedIn. John R. Westerberg has played a pivotal role in the moving and storage industry since the beginning of his professional career in 1962. He served as director, vice president and president of the Illinois Movers & Warehousemen’s Association and Illinois Tariff Bureau from 1966 through 1990. He also served as president of the Movers’ Association of Greater Chicago from 1983 through 1986. Westerberg was a director of the MAGC from 1969 through 1991. On a national level, his previous leadership positions include serving as director for both the American Movers Conference and the National Moving and Storage Association, followed by service as a director for the American Moving and Storage Association. He is also currently a board member and an Executive Committee member of Atlas Van Lines and Atlas Canada. In the early 1980s Westerberg played an integral role in the required surrender of agent Interstate Commerce Commission authority thereby allowing Atlas to effectively compete on a nationwide basis. In one of Atlas’ most challenging times, John took a leadership role in thwarting a hostile takeover attempt, locating a White Knight for interim control of the company and eventually returning Atlas to agent ownership and control.